Queen Elizabeth Bulliebears are the smallest toy breed bulldogs and they do resemble the English Bulldog in all their color varieties. Their coat is smooth like a classic Bulldog or occasionally has 'wully' medium length coats which does not tangle or require trimming. They can be solid, pied, tri-color, brindle or jester [harlequin] in pattern. Some even have beautiful blue eyes! We are striving for our Bulliebears to have chunky bodies and plump little jowls while still keeping the dogs very compact. Sometimes we get very tiny little babies that are slight in build overall. They are called Kewpies and they are also cute! They are truly pocket size starting as little as five pounds, but our more solid, pudgy ones are usually 12 to 15 lbs. 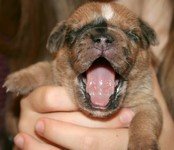 This is considerably smaller than the Miniature Bulldogs other breeders have which range from 20 to 40 lbs. This miniature bulldog breed is still in development and we are making wonderful pets along the way. They temperaments can't be beat. Sweet and calm when you want to snuggle, they're ready to romp and rough-house when the kids call. Queen Elizabeth Bulliebears are pudgy bulldogs having good endurance, no breathing problems or particular sensitivity to heat. They do not have joint disorders or any known genetic problems. 5% of all puppy sales goes towards the 'Get-A-Wag' program to fund placing puppies with special need children and adults. Pocket Bears are not known to have health defects and a one year health warranty is given on all our puppies. Pudgie Bulliebear Toy Bulldogs grow to be a fraction of the size of the much loved English Bulldog. So they are easy to travel with and fit into your home very nicely. They are smart and house train well too. They have good personalities too. They love children and adults and have the temperament to be a therapy dogs. They pay attention to you. The 'Get-A-Wag' Foundation draws contributions for its donation puppies through a portion of the sale of each puppy. You may support our program by purchasing a puppy from Queen Elizabeth Pocket Beagles.